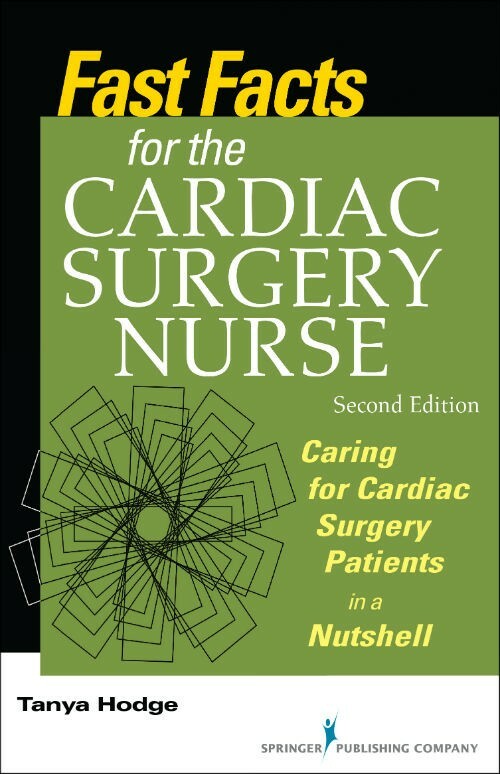 Fast Facts for the Cardiac Surgery Nurse: Caring for Cardiac Surgery Patients in a Nutshell is a little book (208 pages) that provides speedy access to information cardiac surgery nurses use daily. It covers all aspects of care from preoperative to recovery, with an emphasis on prevention and management of postoperative complications. It provides new information on risk factors for stroke, thoracic aortic aneurysms, and congenital heart disease, as well as updates on new surgical techniques and devices. New illustrations help to clarify crucial information and tables are reorganized to emphasize commonly used medications. The resource will be especially valuable to new graduates and nurses who are considering a switch to cardiac care. The second edition includes Fast Facts in a Nutshell boxes delineating especially important content, short easy-to-read chapters, and a convenient pocket size. The heart of the book focuses on post-op complications and nursing interventions to prevent and treat them. Each of the five sections includes nursing considerations and patient education topics. Nurse-sensitive indicators and strategies for improving nursing care are featured throughout. "Excellent book. Just the facts that I needed to know in a concise manner. I learned a lot from this course and am interested in reading other Fast Facts." "Very concise. This is a well organized review for nurses caring for cardiac surgery patients. Lots of pertinent information in a tiny little package." "Good resource for those who need to know the fast facts. Good review for the latest standards."